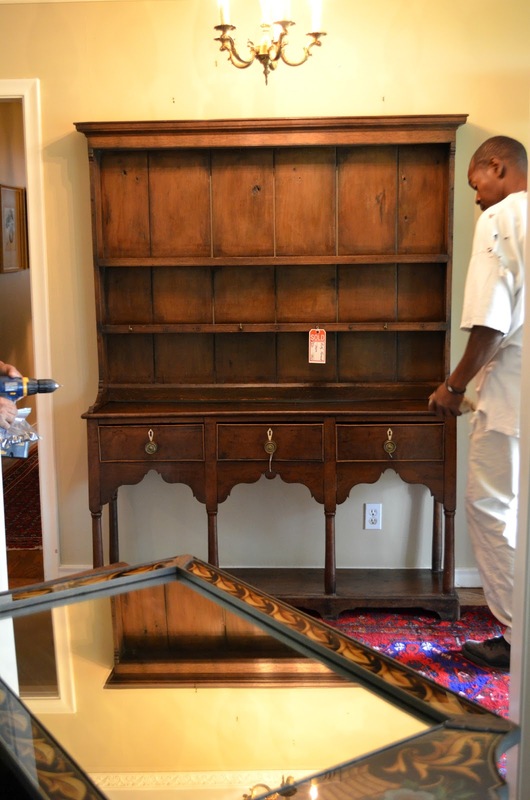 TartanTerrace: Welsh Dresser: It's Here! 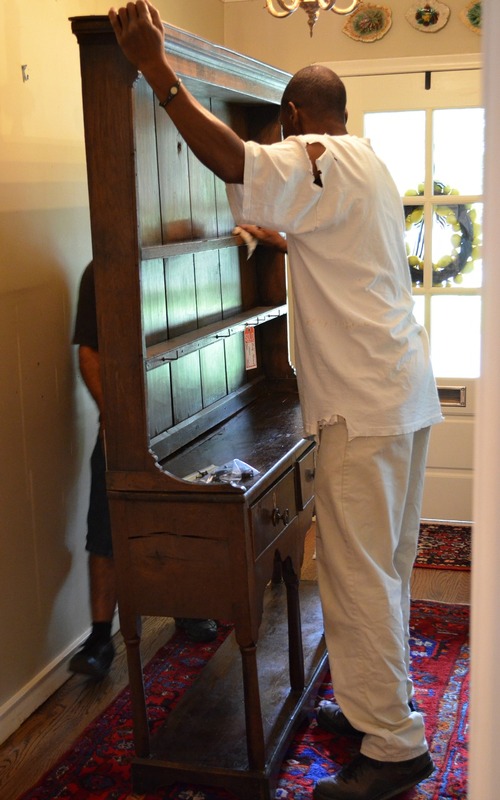 As some of y'all might remember, I bought a Welsh dresser a few months ago without telling my sweet, long-suffering husband. Here's the STORY. Since it's being delivered today, I decided it was time to tell him. OK, I'm kidding. I already told my husband and he took it with a surprising amount of aplomb. I guess he's gotten used to having the whole house turned upside down on a regular basis. So now the fun part begins: styling it. One thing that's obvious to me in the above photo is that I need to get a new overhead light fixture. I'm thinking maybe a lantern? Nothing too big. But I think it needs to be more substantial than the little chandelier that's there now. Joni replaced the ceiling fan with this ultra-cool lantern. OK, I know what ya'll are probably thinking. A little majolica goes a long way. 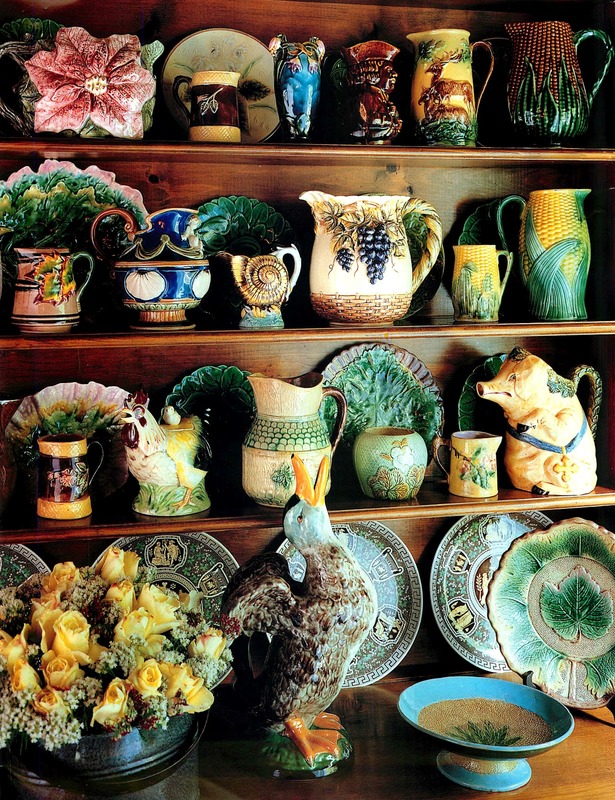 However, most of the above photos have Staffordshire mixed in with the majolica, along with books and other bibelots. And I have plenty of all of that, too. So I'm off to start unpacking all of my junk wonderful treasures. Will post photos as things progress. 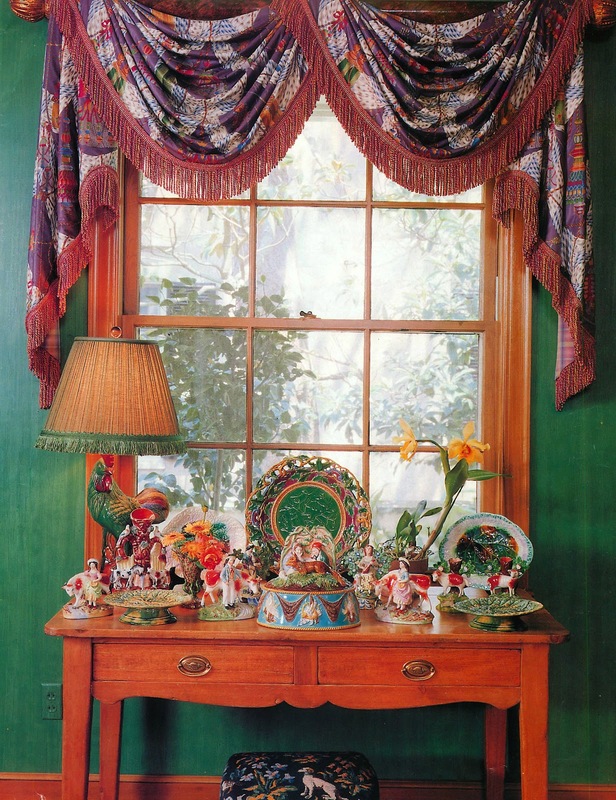 Your dresser is gorgeous, and filling it with majolica, books, and other treasures will be perfect. Styling will be great fun! Enjoy!!! Thanks, Sarah. I need to tackle all of those boxes full of my "treasures." Been putting it off, but need to get to work! Ron - Thanks for stopping by. Still cogitating on how to style it. Mary - I just bought a Majolica fish plate and hope that it will work with my other stuff. Will be posting photos soon (hopefully). Thanks! It's even better than I imagined! Can't wait to see more of your Majolica collection. It will be beautiful there. And how fun to look for a new light fixture! Jewels - Since you're my resident go-to interior designer, I'll drag you with me to find the perfect light fixture! Pamela - I was thinking the same thing. A dark iron lantern would complement the Welsh dresser perfectly. Thanks for the input. Lucky girl! 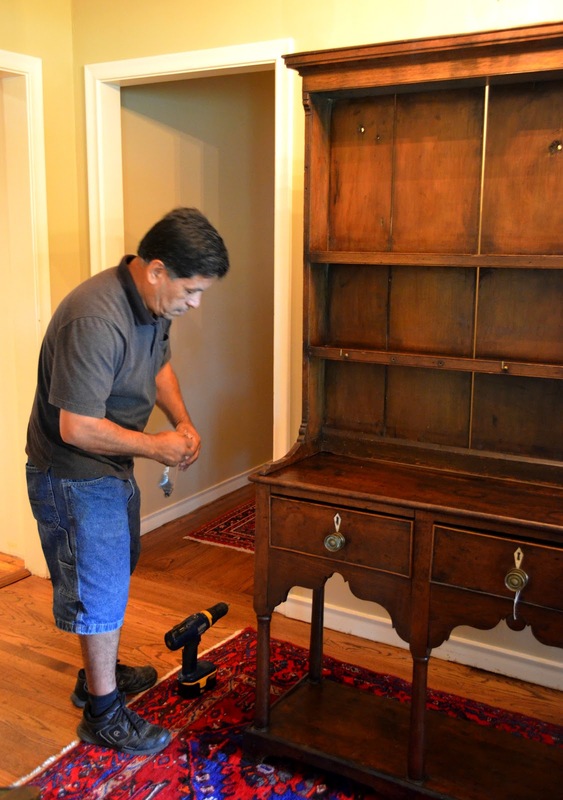 I absolutely LOVE that dresser! Definitely need a lantern! Or maybe something with a tole shade? I swear we must be decor soul mates. I had one for years. It was from an unfinished wood furniture store and made from ash or birch or something. It did not have a beautiful patina like yours. It drove me crazy and I finally sold it last year. Now my majolica sits in boxes :( You will love having this piece of furniture. Good for you and good for your sweet husband for being such a sport. I am not stalking you, I promise!!! 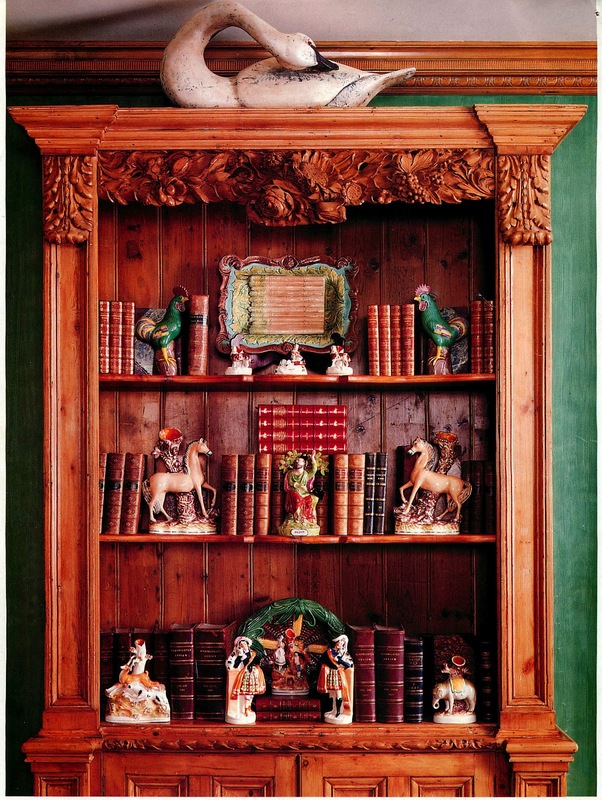 I saw this on Pinterest and thought of your gorgeous welsh dresser. Thought you might enjoy! Karin - Thanks for the link to Lisa Luby Ryan's website. I love the way she styled the dresser. Because her store Vintage Living is in Dallas, I go by there on a regular basis. Maybe in my next life I'll be able to hire her to decorate my house. BTW, I don't think you're a stalker at all! I love getting comments and suggestions. Come back and visit any time!